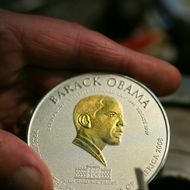 Although this issue is only obliquely relevant to this subject, I am fascinated with this $1 trillion platinum coin concept. Once a joke on "The Simpsons" it may become reality. We're moving from cargo cult economics to outright magical thinking. Why not decree leaves to be currency, each worth ten dollars, and thus solve all debt problems? A White House Petition was started by me. I need 150 signatories to make it public, and another 25,000 signatories and the White House will provide a formal response. If you agree that we need something (banknote, coin, casino chip) that is worth more than $100 sign the petition. I know that the problem with coins is that they must be written off at face value. Banknotes are essentially "liabilities", but they may not have the technology to put an RFID chip on them that survives the crumpling. I felt I had to put some restrictions on their use so that the White House wouldn't simply say that it is a bad idea since large currency is an aid to criminal activity. I got mine after a minute or two to my yahoo email. I would say check your spam folder, but you probably know that already. Yep, nothing there either. Very strange. I also asked for a password reset email and nothing. Thanks for trying, but it's harder than I thought to get signatures. I have 1/4 million views on city-data . I thought it would be easier to get 150 signatures. Most people are dismissing the idea outright saying it will cause inflation or weaken the dollar or only criminals need high value notes. None of which makes too much sense if you replace 8 billion $100 banknotes with some combination of $100 banknotes and higher value "chips". This combination seems odd. How would you do a transaction where you buy something that's less than $20?